He's Jamaican, he's astonishingly fast, he's the 100m world champion and has timed a jaw dropping 19.26sec over 200m. 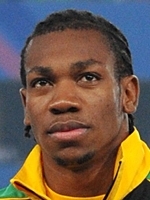 His name is not Usain Bolt, but rather his lesser known 22-year-old compatriot Yohan Blake. "Usain is still the best," insisted Blake after his 200m exploit in Brussels September 16, 2011. Before adding "But next year (at the Olympics) anything can happen." And anything can happen as Bolt will now know after his false start disqualification in Daegu, South Korea left the door open for Blake's 100m world title. Another cause for Blake's high confidence is a newfound consistency as during the 2011 season he ran the 100m in under 10 seconds seven times, twice at 9.82sec. But the 19.26sec over 200m is the figure that will throw down the gauntlet to Bolt as it is just 7 hundredths of a second short of Bolt's world record and Bolt has vowed he will fight Blake tooth and nail for the 200m Olympic gold. The horrifying truth for any 100m sprinter however is that Bolt has timed 9.58 and seems capable if necessary of lowering that. Although most observers would agree that Blake too has yet to fully express himself over the shorter distance. "He has great natural power and is highly resistant. He allies a monumental stride with a swift rate of pace," explains French coach Pierre Carraz, who looks after the local 100m hope Christophe Lemaitre. His ability to accelerate over the final 30 metres would disconcert the stoutest hearted competitor, knowing he's always got something in reserve for the business end of the race which will also help free him of any inferiority complex he might have to his compatriot. Blake sees a grand future for himself in fact and has the 19 second barrier in his sights despite expert analysis predicting that it will be 40-years before that barrier is broken. "I can still improve both my speed out of the blocks and my cornering," says Blake, who has picked up the nickname 'The Beast' for his devastating turn of pace, which is somewhat reminiscent of the American Justin Gatlin, Olympic champion at Athens 2004. The one cloud on Blake's horizon was a murky alleged doping incident in 2009 when he and four other Jamaicans returned A samples revealing a stimulant similar to one on the banned list. The B sample testing resulted in all of them being cleared. The Olympic 100m final will doubtless provide great drama, and it would be no shock to see Blake challenge the field and maybe even Bolt too.